The size preview window in Windows 10 can be quite easy to adapt, provided the preview is enabled in the MS-Explorer! The preview windows in Windows can be easily activated, or deactivated, which is very convenient, especially for Tablet PCs or Ms surface, here the screen area is very limited, when disabled you then have more of the Explorer pane, especially if you move or copy files and folders. 1.) ... Customize the Preview Windows size! 2.) ... Switch the Preview to file details! See also: ► Turn off windows 10 search indexing service (customize, disable)! 1.) 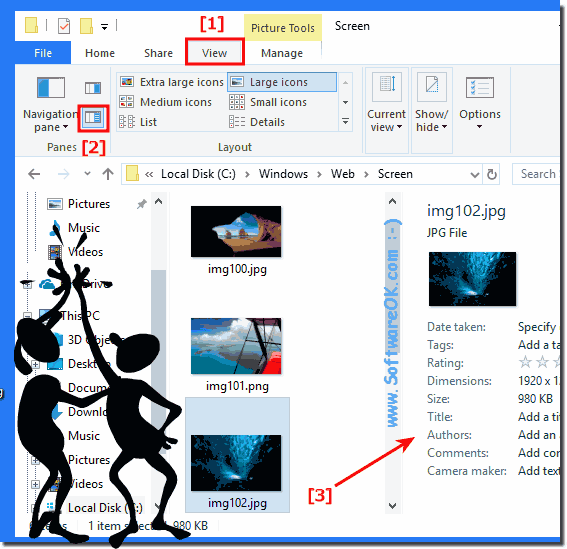 Customize the Preview Windows size! Please run the MS-Explorer eg with the key combination Windows + E and click on the tab (Tab) view. Now please activate simply the Explorer preview. (... see Image-1 Arrow-1 & 2) The same goes with the ALT + P! The dividing line (splitter) to the preview window is difficult to see. 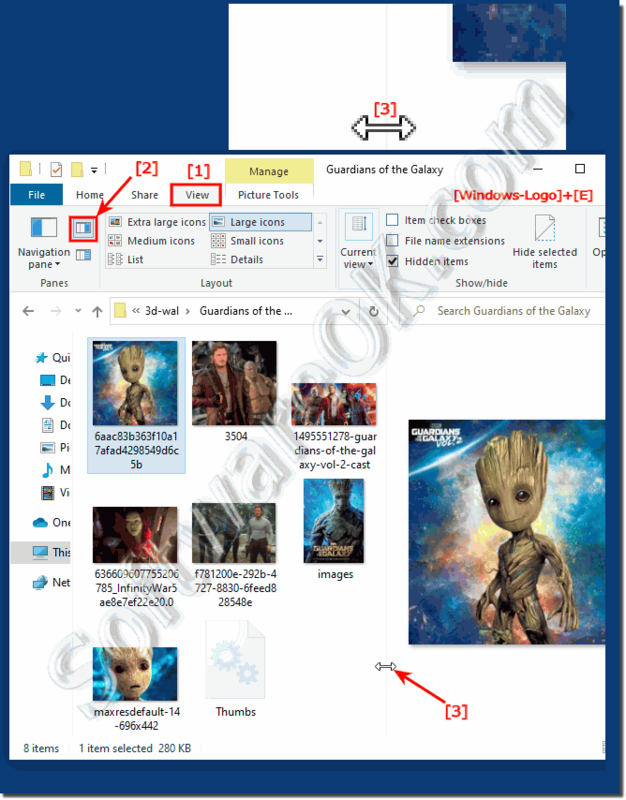 (Image-1) preview panel size in Windows 10! This screenshot has been snipped under Windows 10 Home, However, you can use this example to adjust the preview window size also for other W10 operating systems, whether it's a Windows desktop home, tablet-PC, Surface Pro / Go, or even a server operating system. 2.) Switch the Preview File details! (Image-2) File Details in preview window! This example is also for Windows Web Server and other Microsofts Operating Systems for example: Windows 10 (Redstone 4 & 5), 8.1, 8, 7: Pro, Home, Enterprise, Basic, Premium, Professional, Starter, Ultimate, Windows-Server 2016, 2012, 2008 the preview pane is a very impressive feature of File-Explorer on Windows! Windows-10 - FAQ-63: Adjust the preview window size in Windows 10, how to (MS-Explorer, enable)?